A complex of seven beautiful villas built upon a hectare of majestic land. It is the first eco-friendly villa on the island that is actually doing its utmost to preserve the island's beauty and future. The seven villas are built using recycled teak wood and lovingly designed to reach an ultimate balance of art and function without disturbing the natural character of the surrounding environment. Nestled among palm trees and open lawns, each villa is individually decorated and looks out over the breathtaking beach and sea. We have 4, 1 storey Villa Units with 2 bedrooms and 2 en suite bathrooms. 3, 2 storey Villa Units with 3 bedrooms and 2 bathrooms and 2 Bungalow Villas with 1 bedroom. Four of the villas are one-story villas. Each villa features two-bedroom with open air shower en-suite bathroom. An open living and dining area are joining together with a well equipped kitchen. -Our villas have a maximum number of guests which we ask to be respected. -Maximum occupancy in 1 bedroom is 2 adult and 1 child under 12 years old. -For infant 0 2 years old, we can provide a baby cot, FOC and subject to availability. -For child 3 5 years old, they are allowed to share bed with parents, breakfast is not included. -For child 6 11 years old, we strongly suggest to take an extra bed at USD 20 per night. Three of the villas are two-story villas. Each villa features two adjacent bedrooms on the second floor, with a connecting toilet in between. An open air shower bathroom is set on the ground floor. Next to that is a fully equipped kitchen unit which is a separate room. The living area is set on the balcony of the second-floor and the dining and sitting area are on the ground floor on a spacious terrace. 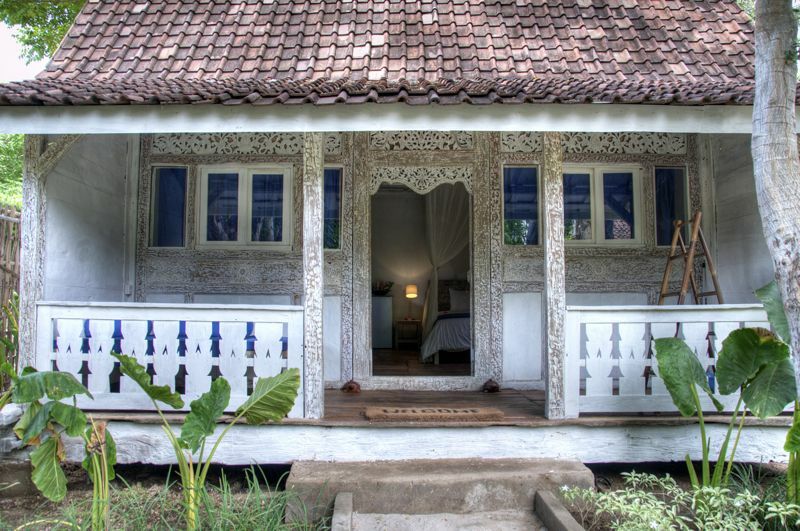 Bungalows are beautiful traditional style Bungalows right on the beach situated in Gili Trawangan. They each have 1 bedroom with en-suites and are perfect for a tranquil humble stay. You share the same grounds with all the Villas for this exclusive beach front property. Perfect for couples, friends and family.